We are a leading Manufacturer of ointment manufacturing plant and ointment plant from Mumbai, India. The plant is designed as per the CGMP and FDA guidelines. Completely closed loop system as per GMP requirements. Integrated system makes it easy to operate and clean. A bottom entry homogenizer provided at an angle for proper homogenizing of the product. A variable frequency drive (VFD) for both the anchor agitator. The agitator is provided with suitable PTFE scrappers to cover the entire internal surface of the vessel. Process control for individual items at each level of production. The gaskets are food grade silicon, conforming to GMP guidelines. 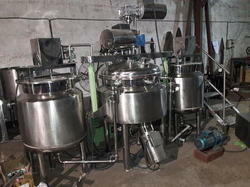 Contra mixer with two motors for preparation of foaming products like toothpaste, etc. Perforated anchor agitator for difficult to mix products. 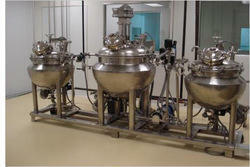 Completely closed pre-preparation vessel for manufacture of sterile preparations.